[2014-2015] Amongst the free samples of new seasonal flavors that Gelato Fiasco was cool enough to send over, there was one pint in particular... that managed to fall behind the frozen veggies and tater tots in the freezer downstairs. Hehehehe, sorry about that GF. Now let's stop for a second right there before we dig in. 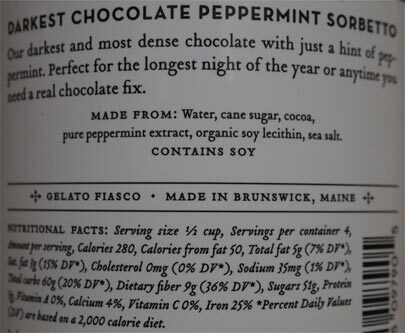 A "hint" of peppermint? Really? That threw me totally off guard here. 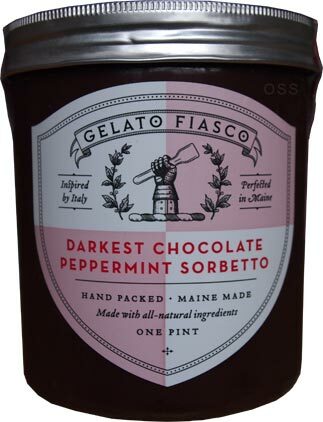 I mean, GF is always thinking outside the pint, but I wasn't expecting such a mild tweak to the dark chocolate noir sorbetto that they already offer. I take one bite and I'm reminded how awesome dark chocolate sorbetto is. It's a very unique experience, well, at least when GF does it. I was alluding to it earlier, but when they say hint, they mean hint. It's almost imperceptible. I can literally see it more than I taste it. Look closely at the scooped picture again. See a little puddle of white, and another little puddle of really dark red? That's the peppermint flavor. These little pockets are everywhere, yet it's the most delicate of flavorings. One final comment. 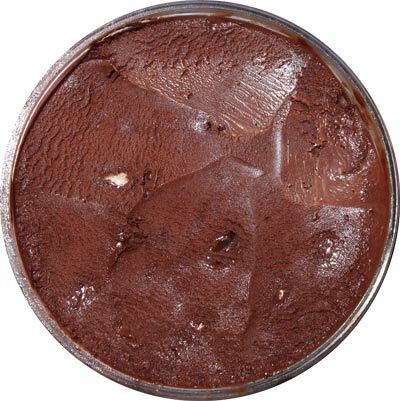 I don't know if it's my imagination or the little sugar puddles, but this one seems a little smoother (wetter) than the straight chocolate sorbetto. The puddles seem to be counteracting the dry bitterness of the cocoa a bit... and for me, that's a cool thing. This is still a slow scooper, you still want to savor each small bite, but I had more encouragement to keep going forward. On Second Scoop: Well, this was unexpected. Opening the pint has let the peppermint breathe and it's much more noticeable now. It's not a peppermint kick mind you, but there's no denying it's existence. The third scooping may have even been more balanced. I've never noticed this in a mint flavor before, but there's a first time for everything! Hey Dubba! I always read but don't usually comment. Just wanted to say thanks for doing an awesome job with your reviews and for sticking with ice cream blogging for such a long time! It's pretty incredible how long you've been doing it! Anyway, I don't know if I would knock off two stars just because it doesn't match your personal preference for a dark chocolate sorbetto, one star is fine, but you want to factor in texture and quality and all that jazz, or maybe you were just flustered by the price point and it not matching your hopes. We've all been there.